Some works of fiction can be read in just a few sittings; others take somewhat longer. The Farewell Angel is not a book to be rushed. This novel, titled La Reina de las Nieves (The Snow Queen) in its original Spanish version, has to be enjoyed at leisure to appreciate the richness of a narrative that uses long, evocative sentences, which have not lost their impact in translation. On the day he comes out of prison, Leonardo Villalba finds out that his parents have died in a car accident and he is now heir to a considerable fortune. What follows is Leonardos trip through his memories and his search for himself as he goes through his parents town house and his fathers papers. Leonardo is the child of a detached, neurotic mother and a diffident father and the main prop of his lonely childhood is the strong presence of his grandmother in the protective setting of the Quinta Blanca, the old family site by the sea in Northern Spain. Leonardos fondest memories are of the fairytales told by his grandmother, particularly Hans Christian Andersens story of Kay, the boy kidnapped by the Snow Queen, who chills his heart until Kays childhood sweethearts tears melt the ice and "an ice splinter falls out of his eye". It is left to the reader to decide, after learning his story through Leonardos stream of consciousness, whether he is just a profoundly damaged individual who appears to have lost all trace of emotional sensitivity or he is a manic-depressive verging on more serious mental illness but whichever way, the story explores the scars created by a childs flawed relationship with his flawed parents and his desperate search for a mothers love. When his grandmother dies, she leaves the Quinta Blanca to an absent Leonardo who only returns for the funeral and insists on selling the house immediately. A few years later, on his return from being imprisoned for a drug offence, Leonardo makes a startling discovery and decides to buy back the ancestral home he was once eager to dispose of. His journey through his fathers archives and a brief encounter with a special girl start to awaken his sensitivity, and his final arrival to the Quinta Blanca complete a circle in his life and put him in touch with a love he did not know was his. Strictly speaking, this novel does not have an outstanding plot; if we examine the story for itself, its elements would not look out of place in a Latino soap opera. What matters here is Ms Martin Gaites skilful layering of moods and feelings and her treatment of the characters, particularly Leonardos whose plight for love is bound to have resonance in many quarters. 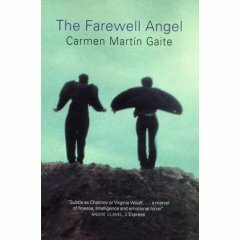 Beautifully written, The Farewell Angel is a sensitive insight into a young mans quest to recover loves lost years.